Brendan Irvine wrote himself into the history books in Baku yesterday, becoming the Irish athlete to win a medal at the European Games. 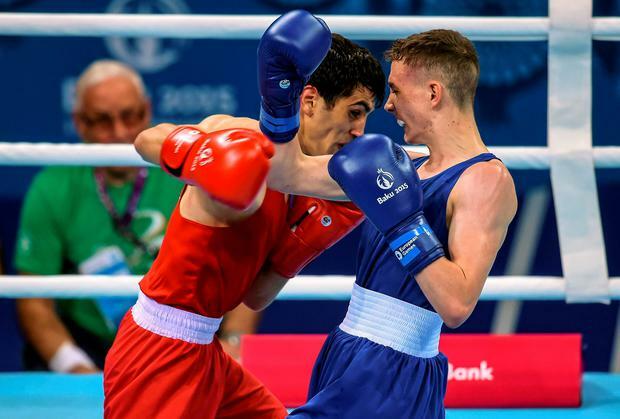 The Antrim light-flyweight produced the performance of his career to beat Azerbaijan's Salman Alizada, the No 1 seed in the 49kg class, on a split decision (29-28, 29-28, 28-29) in his own backyard to book his ticket into the semi-finals. The win assures Irvine, at 19 the youngest member of the Irish boxing squad, of at least a bronze medal. Alizada was beaten by Belfast's Ryan Burnett - who has since turned pro with Ricky Hatton, in the 2010 Olympic Youth final and Paddy Barnes at the 2013 European Championships - but was the favourite to advance in front of a partisan crowd in his home town. And the marauding local edged the first round on all cards, forcing the Irish corner of Billy Walsh and Zaur Antia to revert to Plan B. "Brendan was getting hit on the way back out and we had to change tactics for rounds two and three. He was absolutely superb," said Walsh. The change of plan worked as Irvine, unleashing his entire arsenal of jabs, upper cuts and hooks and avoiding most of the return fire, dominated the last two frames. Outrageously, one of the judges scored the second round, which Irvine bossed, against the Irish elite champion, who will meet Dmytro Zamotayev of the Ukraine tomorrow for a place in the final. "I'm buzzing after the win. It's a proud moment for me. He came forward a lot in the first round and I had to step it up in the second and third," said Irvine. "I knew it was going to be tough. He was the No 1 seed, but I just focused on my own performance and made sure I left everything in the ring. The atmosphere probably drove me on more than it did him. "It's very special to be the first Irish medal winner. But I definitely won't be the last. "The whole experience here is fantastic - the competition, the training, the food and being part of it all. I'm really enjoying it and I'm very proud to get to the semi-finals. "I don't know much about my next opponent. I'll just stay focused and stick to my boxing in the semi-finals." Cavan BC flyweight Ceire Smith bowed out following a pulsating contest with Salana Sagatavea. The Russian earned a split verdict (39-37, 39-37, 37-39) after a 51kg slug fest. "I knew going into it, it would be a top fight. It's the top eight in Europe that are left - it's the crème de la crème," reflected Smith. "I fought that girl last year and I knew she was very tough. She has a great engine. "A split decision is always hard to take but it's a long way from last year when she destroyed me. She's not European silver medallist for nothing." Tipperary super-heavyweight Dean Gardiner, in his second fight back since breaking his right hand in the World Series of Boxing in February, also had to settle for a top-eight finish after dropping a unanimous decision (29-28, 29-28, 29-28) to Tony Yoka. Yoka's crisper left jab and mobility proved to be the deciding factor. The French orthodox took the first two rounds, but Gardiner battled back to claim the last. "I was beaten fair and square" he admitted. "I'll look over it, see where I went wrong and improve for the next day." Adam Nolan (5pm Irish time), Sean McComb (10.15am) and Dean Walsh (10.45am) are in quarter-final action today.